Rattlesnake), Eastern Diamondback rattlesnake, Copperhead snake, and Cottonmouth (Water Moccasin). found in a wide variety of environments, including swamps, fields, and wooded areas. snake control specialist for the safest means to remove a snake from an environment where it should not be. mouth up very wide, and this reveals the white interior, which is where the cottonmouth derives its name. encountered in a water environment should be left alone. snake has a rattle on its tail, the snake may not rattle the tail, even when it is about to strike. Snake types in Florida can be numerous, and it is always a guessing game whether or not a snake may be poisonous or dangerous. snake control and snake trapping specialist should be called immediately to humanely and efficiently remove a snake from an area. 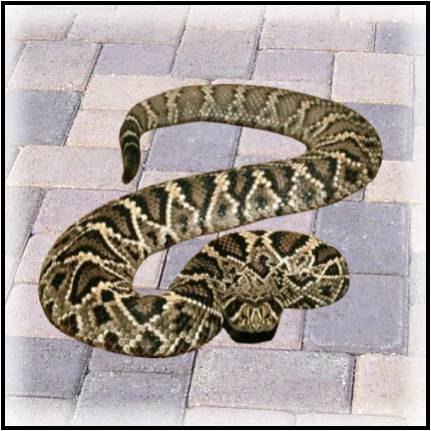 Snakes can be dangerous to humans, especially small children, and household pets such as dogs or cats.